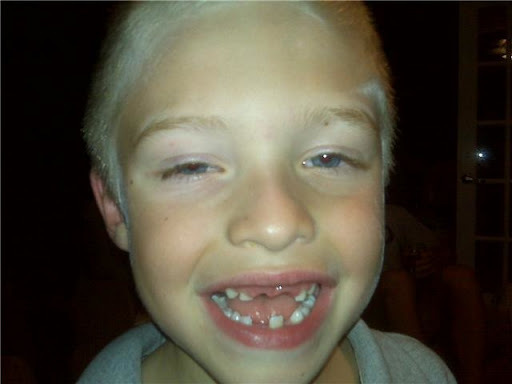 for Christmas is his three front teeth. He’s been dropping teeth like America drops bombs, with amazing tenacity. In all seriousness, it’s incredible. He lost the two top ones the last two nights. The budding fundraiser this one is, he somehow talked “the tooth fairy” into giving him $2 for the big teeth. He made a powerful argument with substantial evidence to back it up and was rewarded with $1 more than usual. Brought a tear to his daddy’s eyes it did. Upon seeing him this morning minus one tooth, Tariku told Trysten “you look silly”. To which Trysten proceeded to try to hide the gaping hole with his tongue. After reminding him that most kids who tease like that are jealous (Tariku wants to lose a tooth so badly) he felt better about things. But zangers those are big holes! Cute!!! Owen was just like that. He has lost 8 teeth in just over a year. I think they fell out in clumps like that too! Tariku and Abram should get together! It is so hard to watch older brothers go through fun things like losing teeth… and raking in the money! Awesome!!! My two younger kids are SO jealous of big brother…they cannot wait to lose their teeth as well! great pic. Lily loved her "missing teeth" because she could close her mouth over a straw and it fit perfectly in there. at least the best of the corn season is over. Too cute! My 4 year old can't wait to loose his teeth like his big bro!